Smooth, tapered design, 2.5g in weight. Smooth, tapered design, 6g in weight. Smooth, tapered design, 11g in weight. Smooth, tapered design, 9g in weight. Non-lead for water where lead weights isn't allowed. 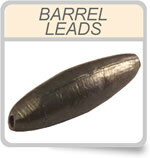 Due to the Non-Lead weight being made from a less dense material, it is a little larger than the size 3 lead. Latex Flying C' bodies cut for 20g should be used to fit this non-lead weight. Smooth, tapered design, 14g in weight. Smooth, tapered design, 21g in weight. Smooth, tapered design, 28g in weight.